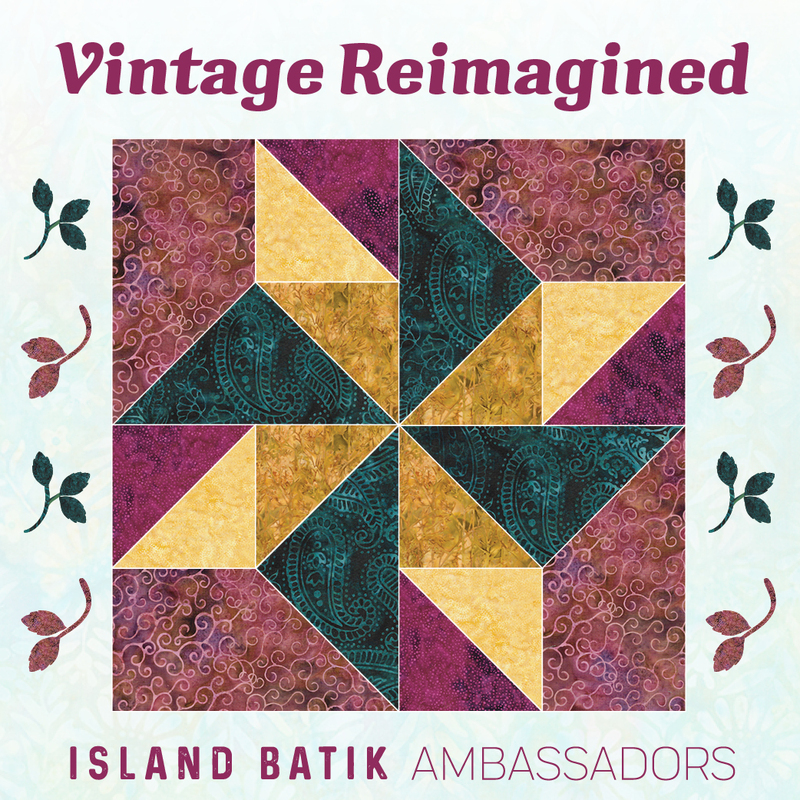 March's challenge for the Island Batik Ambassadors is to take something vintage, and make it new. I played with a number of designs in EQ8, and didn't really know which to do. 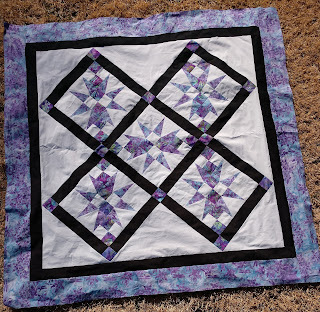 I wanted something square and a good size, so I could use the Hobb's batting from the 2018 boxes, which are lap size, 60" squares. I want to try either the wool or silk batting for this. I printed out the 3 options, and my brother and sister-in-law liked this one the best. And knowing my lack of time, I wanted a few squares so opted for the on point setting. I picked this block from EQ8, and called Garden Patch Variation. 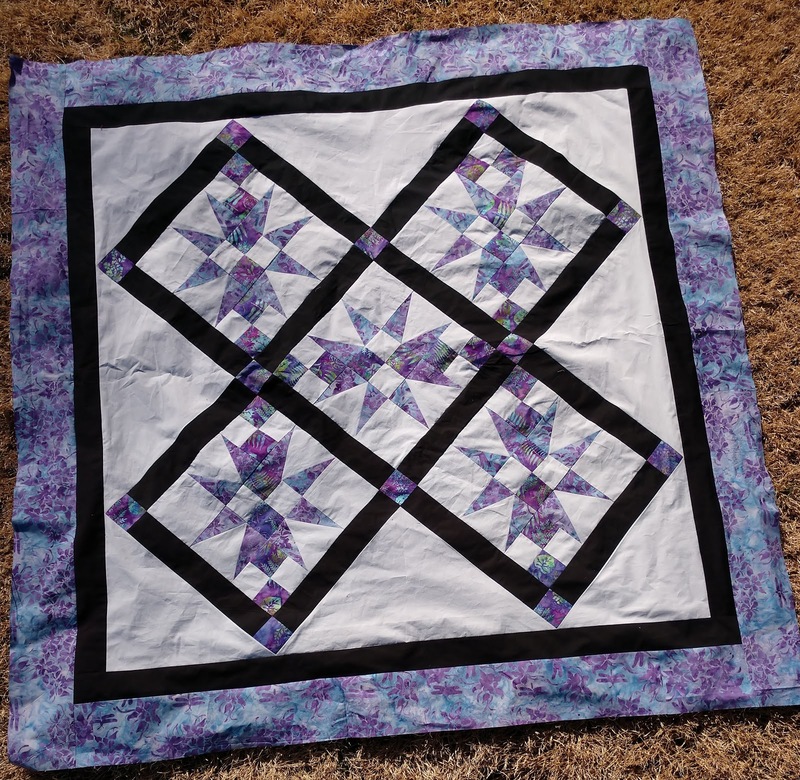 I liked how it looked with sashing and cornerstones, especially after turning the center block's direction, and the pattern that developed. It is about 56" square. 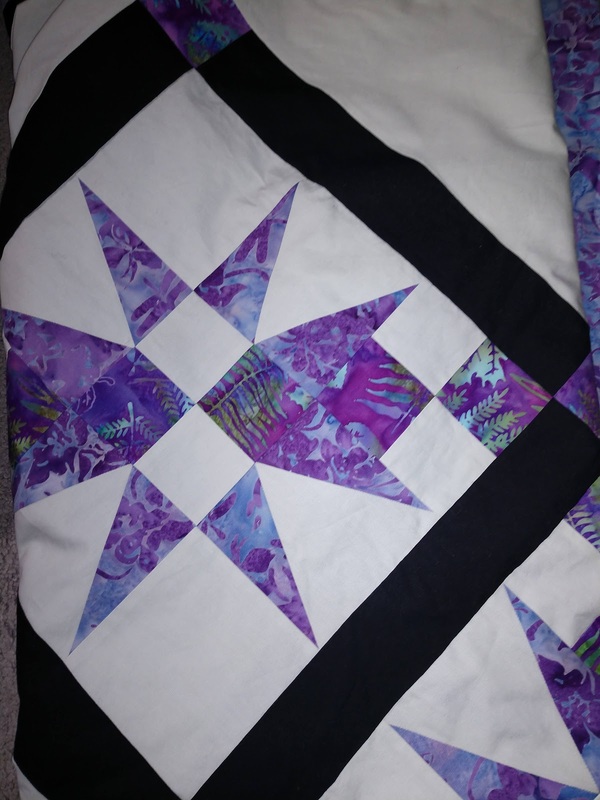 I used the Quilt in a Day Triangle in a Square ruler to make the star point sections, and strip piecing to make the 4-patch sections. 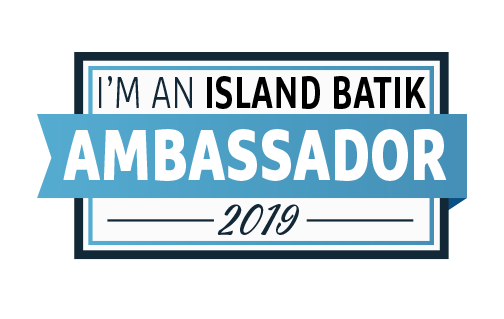 For fabric, I picked a purple and green floral design from my Island Batik Ambassador boxes, and Columbine, which I loved so much I purchased a bolt. I wanted that for the border, too, and have the yardage for sale in my Etsy shop. I wanted to make it more modern by using the Grey and Black solids provided in the Ambassador box. I pieced it with Aurifil thread. I have Black listed in my shop, and will be getting Grey soon. If you want different fabrics or 10" squares, please consider visiting my Etsy shop. I'm going to wait to quilt this. 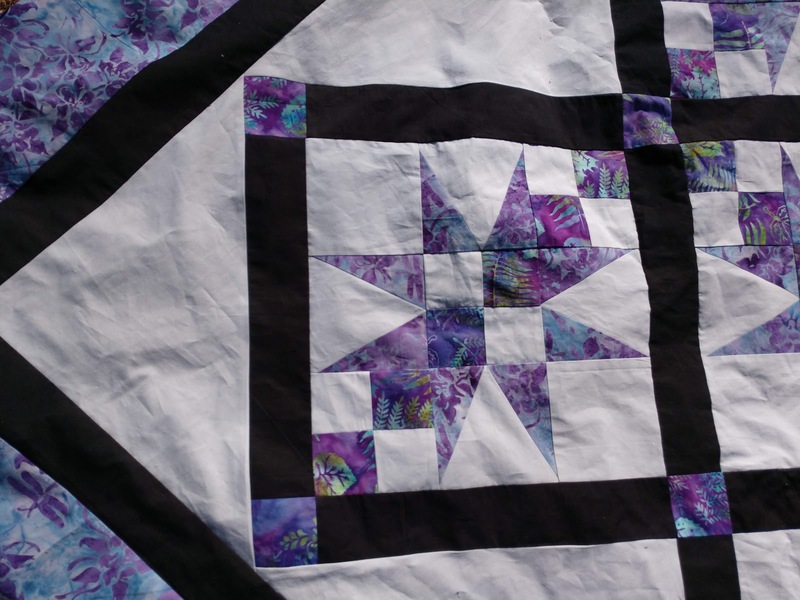 I'm going to be getting a Handi-Quilter long arm soon, and want some tops to practice my quilting on it. 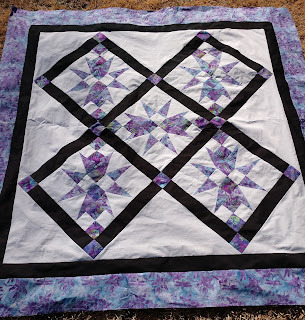 Not many of my UFOs are ready to be quilted, so I figure I'll start getting them to that stage, so I can play when the machine is here and set up. So, be prepared for more finishes! I also need to decide on the backing for this. Thanks so much for visiting and I hope you stop by the other Island Batik Ambassadors to see their Vintage Re-Imagined projects. Many have great stories. Carolina Asmussen ~ Carolina AsmussenGene Black ~ Gene BlackPamela Boatright ~ PamelaQuiltsConnie K Campbell ~ Freemotion by the RiverAnja Clyke ~ Anja QuiltsTina Dillard ~ Quilting Affection DesignsBecca Fenstermaker ~Pretty PineyJennifer Fulton ~ Inquiring QuilterBarbara Gaddy ~ Bejeweled Quilts by BarbDione Gardner-Stephen ~ Clever ChameleonSarah Goer ~ Sarah Goer QuiltsVasudha Govindan ~ Storied QuiltsLori Haase ~ Dakota City Quilter IIJoanne Hart ~ Unicorn HartsMania (Magdalini) Hatziioannidi ~ Mania for QuiltsCarla Henton ~ Create in the SticksStephanie Jacobson ~ Steph Jacobson DesignsConnie Kauffman ~ Kauffman DesignsJoan Kawano ~ Moosestash QuiltingKim Lapacek ~ Persimon DreamsEmily Leachman ~ The Darling DogwoodLeanne Parsons ~ Devoted QuilterBea Lee ~ BeaQuilterToby Lischko ~ Gateway Quilts & StuffBill Locke ~ Studio Bill LockeDenise Looney ~ For the Love of GeeseLeah Malasky ~ Quilted DelightsSally Manke ~ Sally MankeMaryellen McAuliffe ~ Mary Mack’s BlogKathleen McCormick ~ Kathleen McMusingCarol Moellers ~ Carol Moellers DesignsKaren Neary ~ Sew Karen-ly CreatedLisa Nielsen ~ Lisa Lisa and the Quilt JamJackie O’Brien ~ If These Threads Could TalkLaura Piland ~ Slice of Pi QuiltsMichelle Roberts ~ Creative BlondeVicki Schlimmer ~ Vicki’s Crafts and QuiltingGail Sheppard ~ Quilting GailSherry Shish ~ Powered by QuiltingAnita Skjellanger ~ Quilt in a not-ShellLaticia “Tish” Stemple ~ Tish’s Adventures in WonderlandJennifer Strauser ~ Dizzy Quilter <–That’s me! I really like the way that block looks on point. I hope you share it after it is quilted. This is so pretty and I love the colors. I know you have to be over the moon about getting a long arm...excited for you! This worked into a lovely quilt. The solids with batiks are perfect! Still excited about your new Handi Quilter! This is a great quilt and I love their black and grey with the batiks. 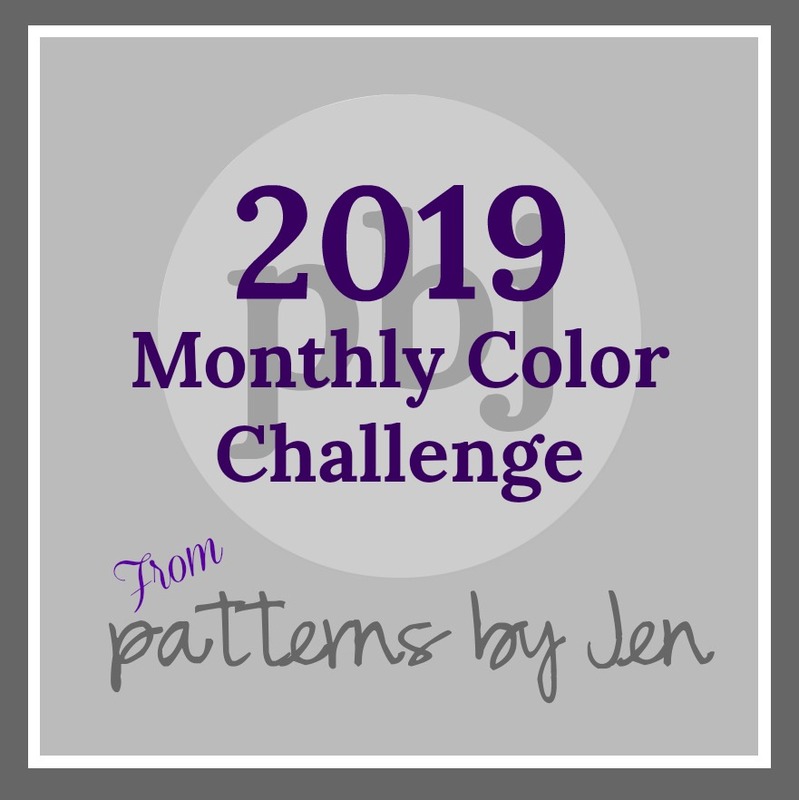 Funny - the grey made quite an appearance this month! Can’t wait to watch the fun you’ll have with your new machine! Really pretty, and I like the blocks on point - they look fabulous in that setting. Pretty quilt, stars look great on point.